Books by PWR members to be offered for sale at the 2018 Fall Bazaar. The Rossmoor Fall Bazaar will be held this year, for the third year in a row, on Saturday, November 3, in the Oak Room at Gateway from 9:00 am to 2:00 pm. PWR authors will be standing by to discuss their creative literary efforts, and their books will be on display for review and purchase at discount prices. Rossmoor’s 2018 Fall Bazaar offers an excellent way to do holiday shopping, and a signed book by an author with a personal dedication to the recipient would make an ideal gift. 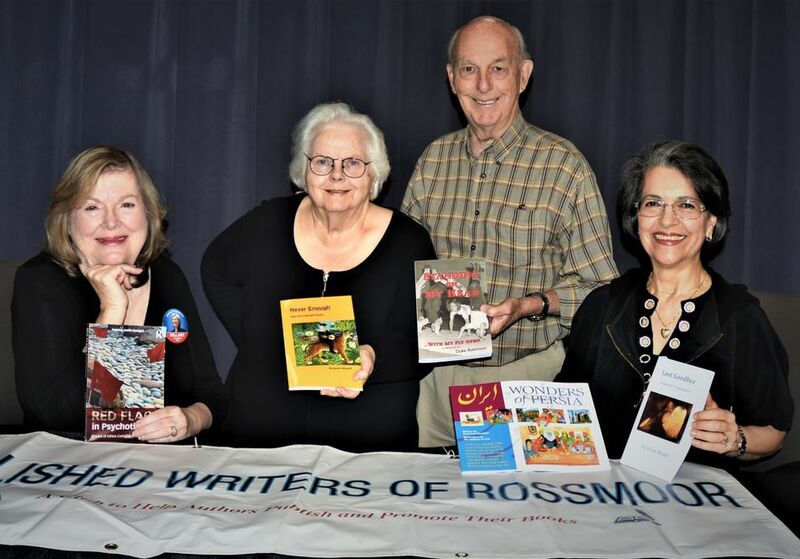 The subjects of the books are wide ranging—both in fiction and nonfiction—reflecting the diverse backgrounds and interests of Rossmoor residents and PWR club members-published authors. Ron Cohn, Phrases, Pictures, and Quotes, A Philosophical Phrase Generator. ​a controversial message in a novel that offers a solution for Bay Area homeless. Lee Gale Gruen, Adventures with Dad, a Father and Daughter’s Journey through a Senior Acting Class, bonding more than ever, as she goes on to become a professional actress. Joanna Kraus, Bravo, Benny, an intergenerational picture book in which a rescue dog wins a grandmother’s affection. Wendy Markel, Postcard History Series. Published by Arcadia Publishing (2009). Illustrated book of early Berkeley. Images of the land as it was prior to development of the University. Harvey Meyerson, Nature’s Army tells the story of how the U.S. Army ran our national parks before the National Park Service was formed. Christine Moran, Otis Oldfield: Complete Lithographs chronicles the Coit Tower muralist. Rosemary O’Neill, Stop, Look, and Listen, a toolbox for creating healthy boundaries. Peggy Snyder, The Ten-Minute Cognitive Workout, presents a simple technique that modifies thoughts, improves mood, and is a sure-fire way to cope with stress. Patricia Teschner, At the Edge of Winter Woods, a collection of poems about the vicissitudes of life, war and conflict, and the beauty of nature. Cassie Tzur, The Nature of Rossmoor, a colorful photo journey through the "four" seasons of our neighborhood, with a focus on the birds and wildlife among us. Eleanor Vincent, Swimming with Maya: A mother’s grief after the death of her 19-year-old daughter is transformed when she decides to donate Maya’s organs to strangers. Estelle Watts, Say What? Poems, and Poems Again, three books of poetry. Bob Wolf, Honey, I Sold the Red Cadillac, a caregiver’s experiences while learning how to deal with a loved one’s dementia and hallucinations.